When astronomer Vera Rubin set out to capture spectrographs of distant spiral galaxies, she expected the galaxies to follow the laws of physics. In the mid-1970s, the Georgetown-based astronomer visited Kitt Peak National Observatory in Arizona armed with a new ‘imaging tube’ (designed by her colleague W. Kent Ford) and went to work collecting images of spiral galaxies. “By the end of the first night, I knew that something very funny was going on: each one looked exactly like every other one,” she later told astronomer Ken Croswell in an interview for his book The Universe at Midnight. Her data showed that the outer edges of the spiral galaxies were rotating just as fast as the stars at the center. In astronomical parlance, the galaxies’ rotation curves were flat. Such rapid galaxy-turning shouldn’t have been possible, but it wasn’t the first time that astronomers had observed this behaviour. In 1962, Rubin herself had published a paper arguing that the stars at the perimeter of the Milky Way moved just as fast as stars near the supermassive black hole at the center. And decades earlier, in 1939, astronomer Horace Babcock had reported that Andromeda’s remote stars also rotated with uncanny velocity. In the 1960s, Rubin had also documented the same Andromeda phenomenon with more precise instrumentation. However, many astronomers dismissed these galaxies as aberrations or chalked the anomalies up to instrument limitations. The reason was simple: Newtonian mechanics hold that objects orbiting close to the centre of mass (i.e. close to the sun, or close to a supermassive black hole) should orbit faster than objects with more distant orbits. Nothing in Einstein’s relativity or in quantum mechanics suggested that stars orbiting a galactic centre wouldn’t behave this way. Rubin’s results marked a turning point for astronomy. She convinced many scientists that spiral galaxies with flat rotation curves were the rule, not the exception. That meant that either Newtonian mechanics didn’t work at galactic scales — or that astronomy was missing something. And whatever that something was, it had to be massive. The concept of dark matter ― an unseeable but massive substance that accounts for gravitational anomalies throughout the universe ― dates back to the 1930s and one of the first self-declared astrophysicists. Bulgarian-born Fritz Zwicky was studying a clump of galaxies called the Coma Cluster when he noticed that none of the galaxies were big enough to hold the group together. Based on mass estimates derived from starlight, the galaxies in the cluster should have been flying off in completely different directions. Zwicky proposed that there must be some sort of unseen mass of ‘dunkle materie’ or ‘dark matter’ holding the cluster together. Around the same time, Babcock hypothesised that Andromeda’s outer arms must be heavier than they look in order to account for their rapid motion. At first, most of the astronomy community paid little attention. But in the early 1970s, more and more astronomers began invoking the concept in their papers to explain their observations of galaxies. By the time Rubin and her colleague W. Kent Ford published their spiral galaxy results in 1978, astronomers were primed to reconsider their assumptions. A separate study later that year by astronomer Albert Bosma corroborated Rubin and Ford’s results. Flat rotation curves were there to stay. Dark matter promised to be an exciting new arena for astrophysics. The problem was that none of the galaxy rotation curve studies gave clues as to what exactly the dark matter or “missing mass” was made out of. Whatever it was, it didn’t emit any light, making it invisible to most telescopes. It also needed to exert a strong gravitational pull. Sensing that it was an arena where they could make their mark, many physicists began brainstorming possibilities. The mystery also attracted funding for strange, new sky-searching instruments, allowing the number of professional astrophysicists to grow. In the late 1970s and 1980s, many astrophysicists were optimistic about the future of dark matter research. In 1985, Scott Tremaine of University of Toronto gave an informal talk where he compared the recent advances in dark matter research to the revolutionary process science historian Thomas Kuhn described in Structure of Scientific Revolutions. (See our “Paradigm Shift 101” post for a recap.) Researchers were deeply divided over the nature of dark matter, but Tremaine pointed out that most scientific revolutions takes at least a decade or two. 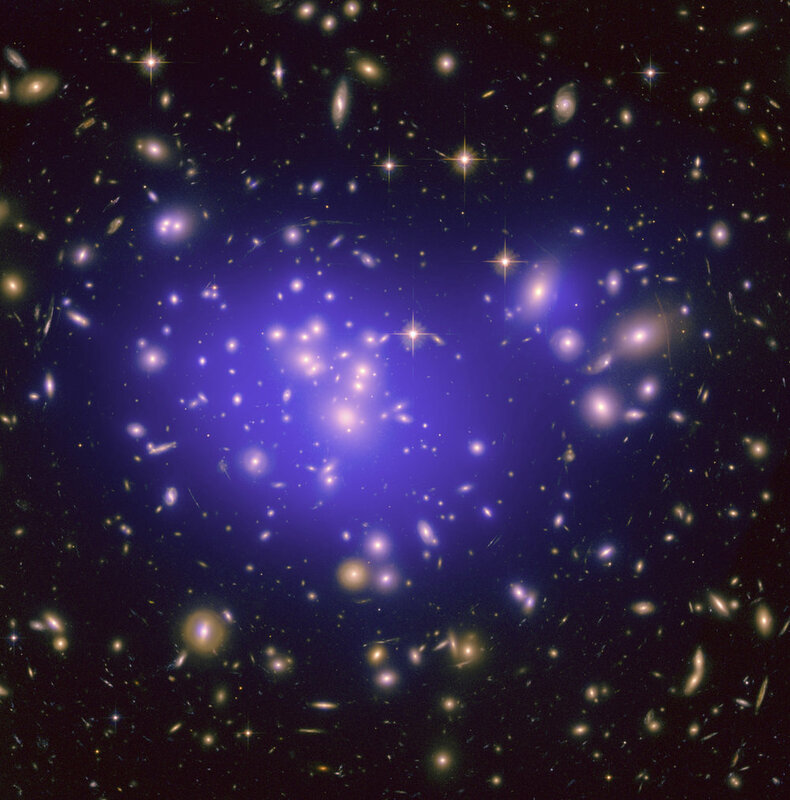 By the mid-1990s, cosmologists would likely come to a consensus on dark matter, he declared. Researchers did not come to a consensus on dark matter by the 1990s. In fact, the “Dark matter’s discovery is less than ten years away” line became a running joke, much to the chagrin of many dark matter hunters. But the uncertainty didn’t dampen efforts to map unseen aspects of the universe; if anything, it contributed to the growth of cosmology, the branch of astrophysics that seeks to describe the history of the universe. Astrophysicists have proposed dozens of possible identities for dark matter over the past forty-odd years, but most of them can be grouped into two categories: MACHOs and WIMPs. WIMPs — or Weakly Interacting Massive Particles — are a hypothetical form of exotic matter that only interacts with our “ordinary” baryonic matter (protons and neutrons) through gravity; these WIMPs would be immune to electromagnetic radiation — including light, radio waves, gamma rays, and most other phenomena that astronomers use to detect objects in space. Since the 1970s, scientists have launched dozens of projects attempting to detect these WIMPs, with many more are in the works (including one in an Australian gold mine). However, to date, there is no definitive and universally accepted evidence that WIMPs exist. MACHOs (Massive Compact Halo Objects) are hypothetical bodies of ordinary matter that simply do not emit enough light to be seen from billions of miles away. According to Croswell’s book, astrophysicist Kim Griest coined the term when some WIMP-favouring theoreticians were bragging about how their hypothetical dark matter explanation had a better acronym. In theory, these dark objects could produce a detectable gravitational lensing effect when they pass in front of a bright star. In the mid-to-late 1990s, MACHO-hunting scientists thought they might be onto something in the Large Magellanic Cloud, but few of those MACHO-sightings have held up. Today, scientists think that a few MACHOs could exist but that they are a longshot at best for explaining dark matter. Another candidate is the axion, a hypothetical neutral particle that is millions of times smaller than electrons. In theory, photons — the tiny, constantly-moving particles that form light waves — have the ability to transform into axions and back into photons. Axions also have the handy property of being able to pass through ordinary matter as if it’s not there, but they still have mass. These tiny particles might be generated by black holes and form massive clouds around galaxies that account for the gravitation. However, confirming that the massive ‘dark’ clouds around galaxies are made out of axions and not some other form of non-baryonic matter has proved difficult. The way scientists think about dark matter has changed a great deal since the 1970s. Early on, researchers thought that the mysterious dark matter must form invisible, heavy halos around galactic perimeters, but most of today’s models say that dark matter, whatever it is, is more diffuse throughout the universe. Today, astrophysicists estimate that visible matter, made up of atoms, only accounts for about 5% of gravitational force in the galaxy. Dark matter accounts for about a quarter of it, while more than half of the universe seems to consist of the equally mysterious dark energy, which pushes ordinary matter apart rather than pulling it together, as gravity does. But one factor has remained constant: There is still no consensus on what dark matter is. Its effects are undeniable, but its identity remains unknown. Some astrophysicists say that ‘dark matter’ is a misnomer and argue that it might not be any sort of matter at all. After all, who says matter is the only way to generate gravity? Still others counter that there may be no dark matter to find. They argue that perhaps Netownian mechanics do not apply at the galactic scale and have proposed many versions of Modified Newtonian Dynamics (MOND). Each version of MOND proposed so far is imperfect; none completely explain the panoply of observations physicists have made on galactic behaviour. But the idea of rewriting Newton has proven surprisingly hardy as a rival paradigm to dark matter. None of this dissension has slowed the pace of dark matter research. Dark matter experiments are currently running from subterranean labs in several different countries, including India, France, China, and the United States. In fact, the United States Department of Energy recently decided to invest US$34 million in a new experiment, in addition to multiple large-scale projects already underway. So does all this research activity mean that dark matter counts as a revolutionary paradigm in the Kuhnian sense? In my decidedly non-expert opinion: Not really. Right now several rival paradigms — WIMPS, axions, MOND, etc. — are competing for consensus status. If and when one of them finally does emerge as the victor, then the cosmological revolution will be complete.